I just found an old photo that your mom took of you at the beach next to the Santa Monica Pier, holding an old rented inflatable surf mat. That's the same day you found a broken surfboard and decided to strip the old glass off and shape it into a belly board. This is where it all starts. The days where you pull out your ten-speed bike and grab the rear door handle of a moving car on Santa Monica Boulevard. Then surf the car door and that bike all the way down to the beach from your family house in Hollywood. You are really good with your hands. You won’t realize at the time that the broken surfboard you shaped into a belly board is going to be the first of a long shaping career ahead. It’s a lot of fun bodysurfing and riding a rented inflatable mat at Bay Street in Santa Monica. But you’re going to see people surf next to the pier and it’s going to spark a new interest; learning to surf will become your obsession. The Jeffrey Dale longboard, under the leaves next to your friend’s swimming pool, is going to be the vehicle of your desire to turn that obsession into reality. Surfing is an amazing experience. The mindset is contagious. You’ll spend hours in the tree house pouring over every surfing magazine you have. The way you see it, you’ll have two options; become a surfer or a greaser. You’re going to be a surfer from the word, go. Good thing your mom and her friends like the beach! She’s going to take you, your friends and your Jeffrey Dale surfboard down to the beach in that old, green Ford Country Squire station wagon. Spoiler alert; you’re going to inherit that car as your future beach mobile. Your first ride on that board will be in the whitewater at Zuma Beach, next to the Malibu West Beach Club. Your mom will also drop you and your friends off at Sunset Beach where you’ll surf all day until she returns to pick you back up. Eventually you’ll surf Hermosa Beach at the beach break during your mom's vacation trip with her friend and her kids. You’ll surf that Jeffrey Dale in the morning and take a beach bike out for exploration in the afternoon. This is going to be a fateful trip. During one of those bike excursions you’re going to ride up to the front door of the Greg Noll surfboard factory. You’ll look through the front windows in the showroom and there’s going to be this giant curved 8-foot tall saltwater aquarium with a huge sea bass swimming inside it. A guy inside is going to notice you pressing your face up against the door window and come over to unlock it. He’ll introduce himself to you as Eddie Talbot, the manager of Greg Noll Surfboards shop and factory. He’ll ask if you’re in the market for a new board and you’ll politely respond, “No,” and tell him that you are starting to make some of your own. Eddie’s a really nice guy. If you ever need some cheap blanks, he’s going to offer to sell you some from the shop. You’ll thank him, ride your bike to the end of the block and come across the whine of a planer from the open back doors of another building. Surfboard scraps will be sticking out of the dumpster. Turns out, these doors open up to the Bing surfboard factory. OK, Stop. Let your curiosity take hold of you. Oh, and that guy with the power planer? 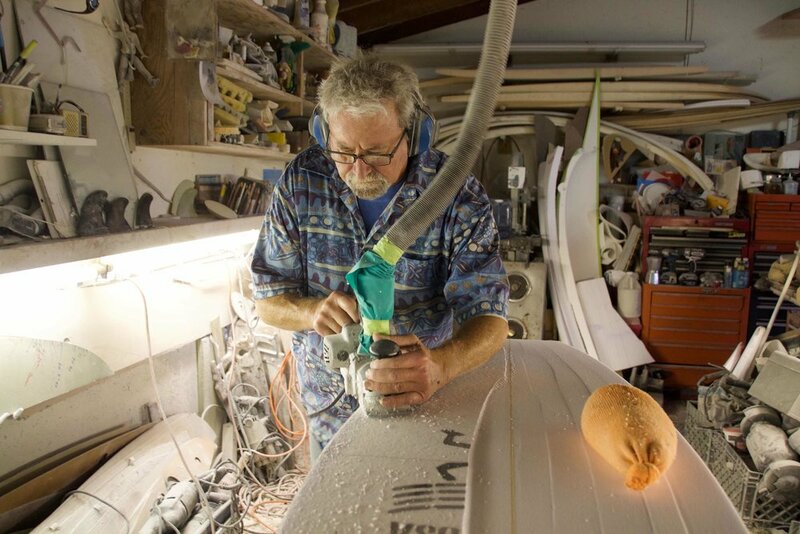 His name is Mike Eaton, a master shaper and designer of many categories of watercraft. Remember him! Years later your paddle boards are going to compete neck-and-neck against his and Dale Velzy's in races such as the Bud Light Series in the 1980s and 1990s. When you turn 17, you and your friend, Bret are going to camp at Thornhill Broome Beach, near County Line. You're going to meet a guy there who will end up becoming a great friend. His name is Clyde Beatty. He’ll reply, “Thanks!” and ask if you and Bret are surfing up here. You’ll get to know him that evening and decide to go surfing together the next day. Life has many interesting circles. You’ll recall the name, Clyde Beatty, from a story you first read as a third grader about a circus trainer named, Clyde Beatty. As it turns out, the Clyde Beatty you’re talking to? That’s the circus trainer’s son, Clyde Beatty Jr.
You’ll also come to find out that you and Clyde live fairly close to each other. You’ll end up surfing together after school almost every day, and travel to Salt Creek in Laguna Beach, mostly every weekend. And although Clyde will be team riding for Blue Cheer Surfboards, he'll ask you to shape a few boards for him to test on the side. But that's still just the beginning. By the age of 19, you'll find yourself getting into a new shaping room at Clyde's, complete with new padded saddle racks, side lighting and “first quality” blanks. 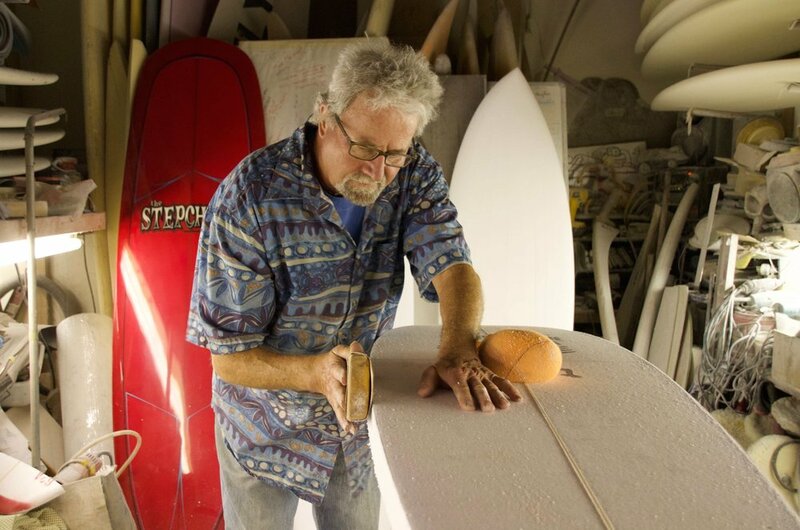 Between Clyde's graphics ability and your shaping craftsmanship, you two will create Ocean Crystal Surfboards by Clyde Beatty Jr., shaped by Steve Brom. Together you will give birth to the Tiger Model. You will go on to shape extra boards for Clyde’s business, but you will soon become the youngest head shaper in Huntington Beach for the famous brand, Dyno Surfboards. One issue in Surfer Magazine, will show a photograph of you in your hang-glider, taken by the famous surf photographer, Guy Moteil, at Salt Creek. That photograph will end up as a large part of a full-page advertisement of your boards for Dyno. This is when you'll meet David Nuuhiwa and begin shaping his surfboards under the Dyno label. He has always been an icon in the surfing world, and David will become a friend and stand inside your shaping room while you are shaping his new designs. This will prove to be a nerve-wracking experience, but it will represent the peak of a shaping session. As time goes on, you’ll end up shaping many surfboards for David, Corky and other Dyno team riders as well. At this point in your life, you will create a surfboard design that will come to be known as the Rocket Fish. However, it will make its original debut at Dyno as the Gun Fish. Not too long after, David will leave his contract with Dyno and you will leave to transition back together with Clyde. The Rocket Fish board design will become the foundation upon which the Tiger logo would become so popular. You’ll never see anybody go faster than Clyde on the Rocket Fish that you shaped for him. (Pelican Point, circa late 70’s). As your future unfolds, you will work with, or for many very talented creators, shapers and surfers; Clyde Beatty, David Nuuhiwa and Lance Carson to name just a few. David had an incredible presence everywhere he went, especially when trading boards in the water. You’ll share a shaping room for a year with Lance Carson, the great surfer/shaper, while at Ocean Surfboards. During this time, loads of influence will come towards the design dynamics of shaping a quality performance longboard. As the years go by, you will put your best effort and creativity into more new designs. You will come to realize that, in spite of some early experiences with the soul-less computer-generated shape. Technology gets to a point where the creation of a respectable copy, from an original shape, is at a level that is approaching your original results almost exactly. You will at some point recreate almost every single category of amazing shapes that you will have developed over the years… to within a 1/30th of an inch. These will be preserved in a digital file, to be recreated by a CNC machine, in foam, from an advanced modeling program such as "Shape 3D” with just a push of a button. You’re “A-Ha” moment will be this. On one day of your early years, you will see in your mind’s eye what you want from inside the clay, the surfboard blank or a block of foam. At that point, you will achieve the idea of being an imaginative shaper/sculptor. It’s very important that this happens, and you will come to trust this vision. As a young designer/shaper, you will appreciate how form follows function; how the organic nature of evolution tends to eliminate the unnecessary. It focuses on the simplistic natural function of the essence. As the saying goes, “necessity is the mother of invention”. You will learn to trust your decisions of design after looking back on nature for validation. You’ll realize that evolution doesn’t have time for gimmicks, and neither do you. Stay up to date with the latest from Shaper Made.